Well, my friends…finally, that day is here! 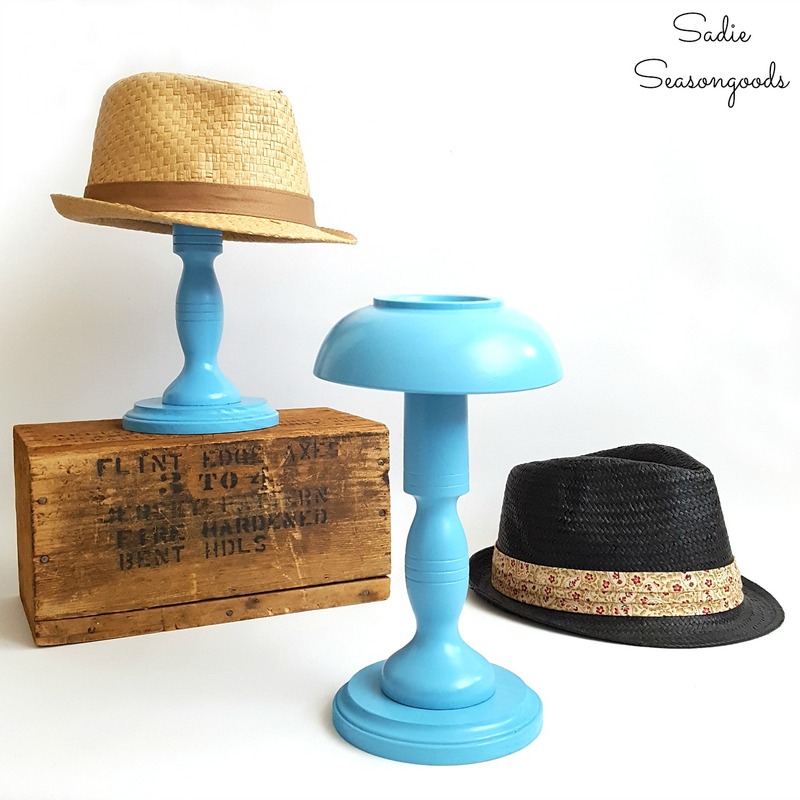 I love the look of vintage hat stands, but they are hard to come by and unsurprisingly pricey. But the look- their shape- is something that can be replicated using a few parts & pieces from the thrift store…in fact, it was this set of wooden bowls that inspired my project. The clear varnish had nearly flaked away over the years, but otherwise, they were the perfect size and shape to hold a Trilby hat- even with their footed bottom. Now, I just needed to find some decent wooden candlesticks to pair them with. I found these- and while they weren’t perfect (more on that later), they would more than do and I could work around their flaws. 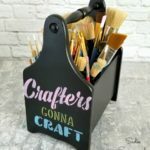 So- here’s where my hat holder / hat storage vision is going…This post contains affiliate links for your crafting convenience. But I needed to do a little prep work first! 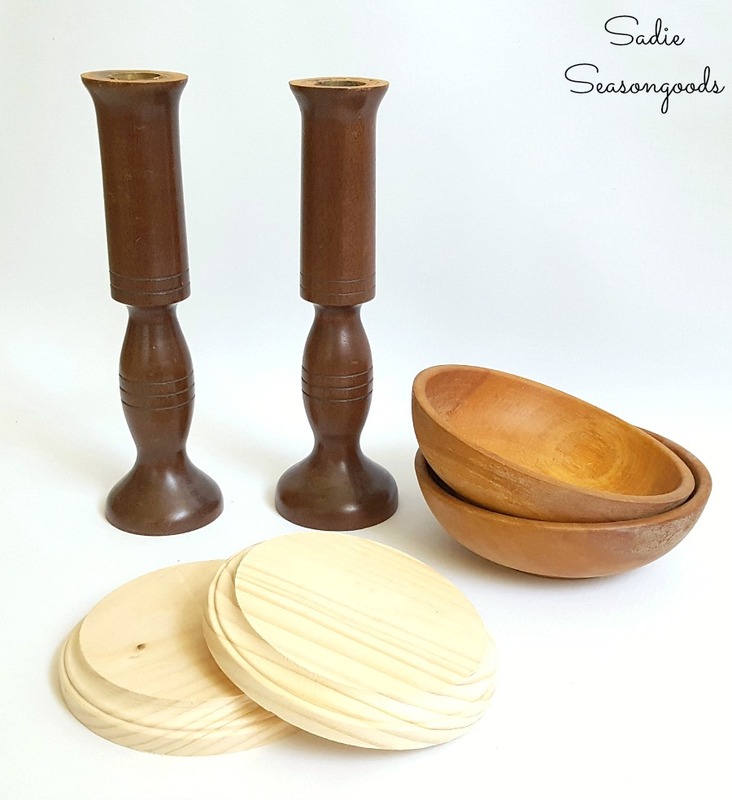 Using our orbital sander, I smoothed out the tops of the wooden candlesticks – this would allow the upturned bowls to sit more flush against them. But while cleaning out the remnant candle wax, I realized just how deep that brass core was…which meant I wasn’t going to be connecting the wooden bowls to the candlesticks with a screw (my original intention). It could be done, but seemed more troublesome than it was worth. The wooden candlesticks also didn’t have a large, stabilizing base- so, to hold something like a wide-brimmed hat, I would need to add a more secure base to each candlestick. Enter a pair of wooden plaques that would serve as bases! Now I had all three parts that my hat holder project would need! As I studied my parts, I wondered how to coordinate them- staining the wooden bowls and bases to match the candlesticks sounded awfully daunting. I LOVE wood stain, but I suspected that no amount of stain-matching would yield a seamless appearance. Plus, it sounded like a lot of work in my garage and it was, like, 97°F outside. So, I decided to paint them- not my first choice (I really did want the look of natural wood), but the splashy blue won me over in the end. To connect my hat holder project together, we drilled a hole through the center of the base, a pilot hole into the bottom of the wooden candlesticks, and drilled a 2” wood screw through each. Then, I used my favorite wood glue to fix the wooden bowls to the candlesticks. A screw would have been ideal, but sometimes thrifters can’t be choosers! Because these wooden salad bowls were vintage and hand-turned, they were a little uneven on the inside. But I like the touch of askew-ness and it doesn’t affect its hat-holding abilities at all! After the wood glue had set, I re-enforced the junction with a bead of hot glue– it’s not visible unless you turn over the hat holder, and I’m all about a little glue insurance. Especially since my original plan to use screws was thwarted. And there you have it- hat storage that is simply perfect for a Trilby hat! I love creating accessory organization from thrift store finds. I’m already on the hunt for additional wooden candlesticks- I still have three wooden bowls left…and many more hats! Interested in more upcycling ideas using thrift store treasures? Please check out my full collection of projects here before you go! Haha, thank you so much, Marie! I love your quirky style. And great ideas. And I’m also jealous of the Summer weather you appear to be enjoying. We had three consecutive days of sun in the past three weeks. Arghhhh!. I love this! I have a cloche hat that sits in my closet getting mushed. I will be doing this soon. Pinning to share. Thank you so much, Kileen! You just ooze talent and imagination! I am so doing this project. Thanks! Great repurpose project Sarah, and a wonderful display piece. Love the color and I’ll never overlook a salad bowl at the thrift store again! My daughter loves hats & could use a few of these in her room. Love this project. Thanks for sharing at the Inspiration Spotlight party. Shared. Love how you’ve repurposed those items. Such a cute and clever way to display your hats! Love it! This is so clever. I may have to buy a hat so I have a reason to make these. Great project. Sarah, I love how these turned out. Now I am kicking myself for not buying the salad bowls recently at Goodwill! Isn’t that always how it happens?? Sarah, great project! I love the blue paint. So practical to create something useful out of “nothing”. Thanks for sharing at Your Inspired Designs. This is SO pretty and SO genius Sarah, love the colour, that blue is so bright and happy! Super fun idea… as always! And this is why I host this party – How do you come up with these amazing ideas?? Thanks for sharing at the Pleasures of the NW’s DIY party – and don’t forget to leave a comment – if you comment and your post is featured next week, it will also get pinned and tweeted! Fantastic use of those old bowls! I bet you can create some really cute ones for kid’s hats using smaller bowls! Haha, thrifters can’t be choosers! 🙂 I think these turned out amazing and I love this shade of blue!! I’m so charmed by your hat stand. Pinning now. Thanks for sharing at the #ThisIsHowWeRoll Link Party. So adorable. I need to make a couple for my booth to display some hats. Thank you for sharing at Vintage Charm. Perfect solution to a dilemma of mine! THANK YOU! Very sassy Ms. Sarah! My daughters love hats and they would love these stands also. Thanks for joining us again at Celebrate Your Story and we’re looking forward to what you will share next week. Thank you so very much, Lorelai!! Very fun idea; what a great way to display fun hats! Love the color your choose. Visiting from Homemade and Handcrafted party. Super cute and super cool! What a neat idea! Love the color. These would be so easy. The hubby could use several of these. I made a few of these last year and as well as using candle sticks, I also used ornate stair rails (cut in half to make 2) and also wooden rails from kitchen roll holders. 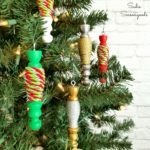 I made little crochet toppers to cover the wooden bowls and added some pretty lace trims. They look so pretty even without the hats on them 😃. Sorry but the site wouldn’t let me share a photo of my own. Very cute! Never would have thought of this. Their perfect together! Love them! The hubby could use a couple hat stands!